Atlasworxs Remington 700 Short Action Detachable Box Magazine (DBM) is machined from AL6061 T6 aircraft grade aluminum billet for strength; however, still remains light weight and strong. The highly durable finish is a Hard Coat Anodize in Matte Black. This model of Atlasworxs Remington 700 DBM comes with hidden magazine realease for ease of use and to reduce accidental activation. If there is a standard for the detachable box magazines used in today's bolt action rifles, it is the Accuracy International AICS magazine. 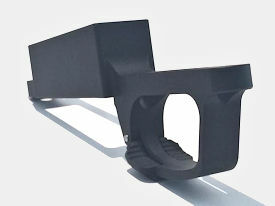 AICS magazines were originally developed for the AI Chassis System (AICS) but are now utilized in various detachable box magazine (DBM) floorplates from several different manufacturers. The AICS magazines are available in either 5 or 10 round configuration. Atlasworxs Remington 700 Short Action Detachable Box Magazine (DBM) is designed to accept reliable AICS type magazines. You should see an increase in accuracy when installed with quality epoxy bedding and Pillar bedding. Inletting is required and recommended to be done by a qualified and professional Gunsmith as most magazine systems require custom fitting to the action and stock to ensure proper fit and reliable functioning. Please Email us for a list of trusted professional Gunsmith with applicable discounts and priority service. Made in Australia by Atlasworxs INC.